Since I began teaching at Peloton, I have to wear my hair up all of the time! I usually would just throw in back in a ponytail; but lately, my amazing nanny will often do it for me. Regardless of how well I take care of my hair, the yanking and pulling and hair ties can also cause breakage and split ends. I am always on the lookout for great hair care brands that work for my hair. I find that the right hair products can make your hair look and feel amazing. 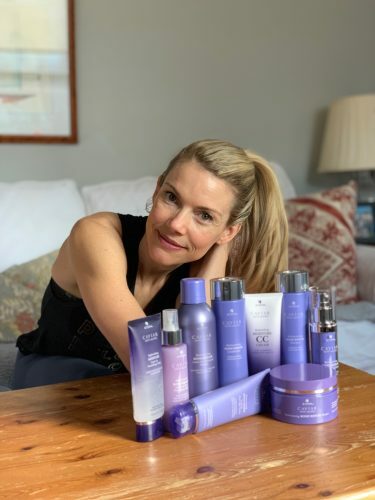 Washing and pampering your hair is also a great self-love tool, and gives you a few minutes to have a moment to yourself (highly needed as a momma of 3 boys!). Cloud 9 Collection: I love love love this collection! Specifically, the Blowout Blow Dry Serum. Because I’m always on the go, time is something I have very little of between and before my Peloton classes. This serum helps my hair dry quicker. It also strengthens it, so that it doesn’t break from putting it in a ponytail day after day. The shampoo and conditioner are so gentle on my hair and I love the smell. Vibrastrait: This straightener is really my secret weapon for getting ready fast. It also gives me the shiniest, just walked out of a salon hairstyle. The straightener itself vibrates and glides down my hair easier to not break any pieces as it detangles at the same time. The Vibrastrait gives my hair a healthier and smoother finish. I find if I blow dry and straighten my hair it braids better and is easier for my nanny to handle! 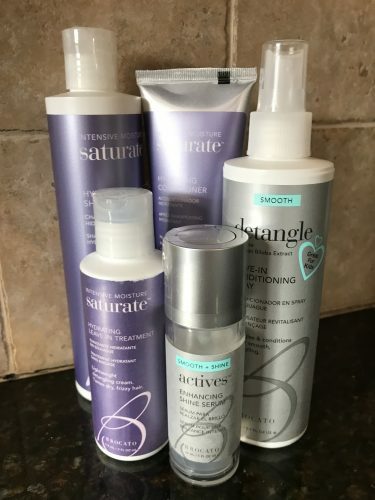 This hair care line is another favorite! In addition to wearing my hair up a lot, I also color it. I often worry about my hair breaking and becoming brittle. The bamboo ingredients in Alterna’s hair products help boost hair strength. I love that the ingredients are sustainably harvested and sourced from around the world. The shampoo, conditioner, and serum, always leave my hair silky smooth; but I’m most obsessed with their hair mask. This sea salt hairspray is vegan and cruelty-free, and makes my hair feel and smell amazing. I always need my hair out of my face so securing it back with hairspray for that extra hold, is my go-to; but I hate the crunchy feeling most hair sprays leave. The sea salt hairspray has aloe vera gel and sea salt kelp extract that adds moisture and a light hold to my hair. 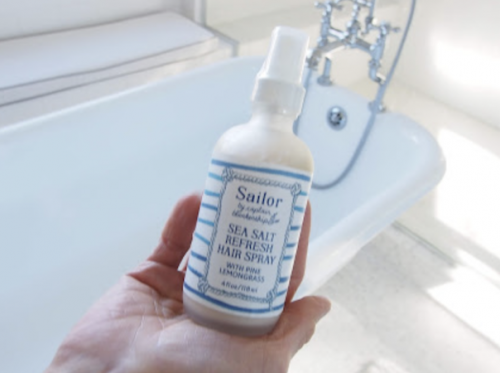 Sailor keeps the strands back; but still leaves my hair soft and smooth, no crunchiness! I definitely like this at the beach too when I want to just let my hair air dry and give it some texture. This braid is so cute and fun that it not only works for my Peloton classes but I have a good all day look as well. The style can be worn to the side right in the back, loose fitting or tightly knotted. It really is a modern new take on braids. This braid is definitely one of my top three faves! These braids are awesome because I can have them on either side of my head which is always a cute look with a hat in the winter. Also, the braids start right at the scalp of my head so I’m never worried about any hair falling in my face during my Peloton classes! This braid is the perfect match for sweaty workouts and lots of movement during any of my classes. It still looks similar to the traditional behind the head and down the neck braid. However, this one is nice because of the reverse weaving technique which lets me keep my hair back and in place and it doesn’t give me any kind of headache because the hair is on top instead of pulling inwards with every movement. I am also a firm believer in eating healthy and nourishing your body and hair from the inside out. Good foods to include in your diet for healthy hair include salmon, spinach, eggs, chicken, and sweet potatoes (all of these are included in my get your body back plan too!!!). 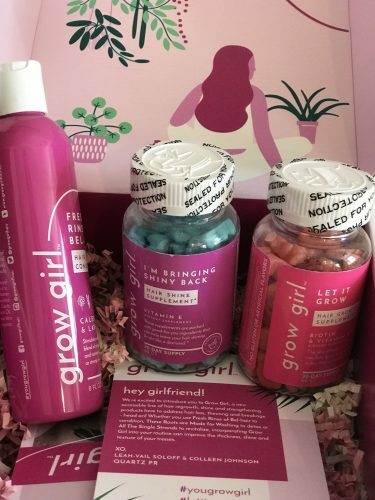 I also just received some hair vitamins from Grow Girl Hair which are super yummy, and I want to see if they help stimulate hair growth. My hair is longer than it’s ever been and I want to keep it that way! I gave my mom the hair regrow conditioner to try since her hair is really starting to thin. I’d love to hear what some of your hair care products are!